An early lesson on twin birth when first studying midwifery or obstetrics is to not risk the scenario of locked twin heads. 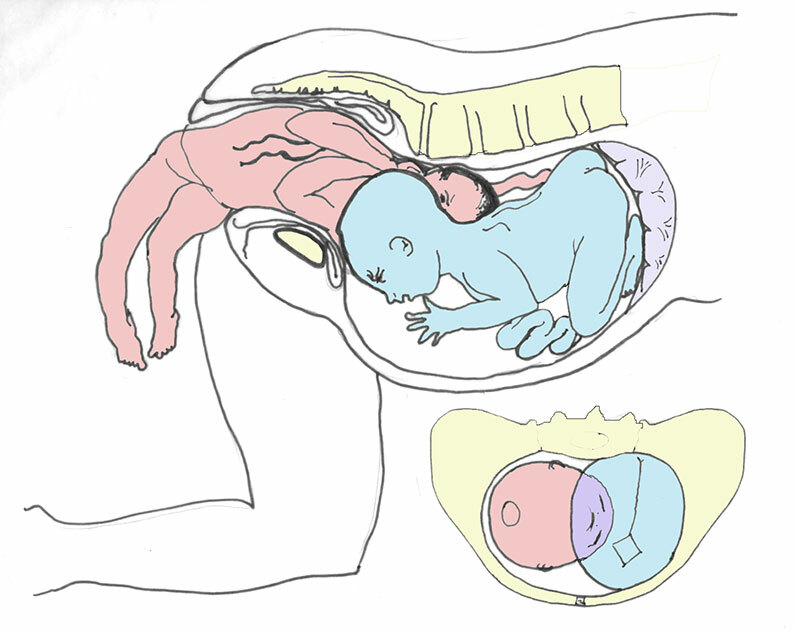 Heads blocking the descent of birth might occur if the first twin is breech and the second twin is head down. The first twin begins to be born and bumps up against the second twins head. The second twin’s head then blocks the first twin’s head from entering the pelvis. Or both heads may be at the top of the pelvis in a way the first twin can come down any further. Once I was called to palpate a first-time mother having breech twins. By the appointment time, the higher twin had flipped to head down while the first, or lower, twin remained breech. The mother wanted to give birth vaginally and to help myself understand the risks, I called upon the expertise of Diane Goslin who has been a midwife for hundreds of sets of twins and breeches. She said she herself has never seen a case of locked heads, though she herself consulted with local doctors about this potential, none of them had seen a case in decades of vaginal twins in their large area of Amish communities and the high vaginal twin birth rates. Diane proposed that if the second twin’s amniotic sac remained full of water that the potential of heads held together is unlikely. During the labor of the breech twins I was called to palpate, an ultrasound was done to verify the first baby was breech. The image was misread and along came two feet. The first twin was born breech but not without some unrelated events to the fact of being a twin. I’ve written about this birth in Midwifery Today magazine. But does the event of locked twins actually exist? Along comes Dr. Stuart Fischbein, a homebirth physician in Southern California attending breech births. He describes such a rare case occurring under his watch. With deft hands, he unlocks the heads and the birth is completed. Be sure to read the amazing story in his published case study. I LOVE the illustration and photo. We see in the photo that the baby is higher than what we see in the case of breech shoulder girdle dystocia. This is very very helpful! Thank you, Stuart Fischbein, for advancing the safety of breech birth and reducing the reasons that advanced practitioners with breech skills would resist helping some cases of breech-cephalic twin birth! The rarity of locked twins is not equal to surety of locked twins. Expectation of a rare event is not the best first decision maker. But physiological management must include readiness for a rare event. In other words, I’m challenging the decision to avoid first twin breech births and encouraging readiness for the rare event while allowing the opportunity for a physiological birth. Of course, the parents and providers need resources to ready themselves. Birth teaches us not to assume anything.